September 6, 2014 - STOH performed in East Nortport, Long Island. Even grandmaster Guolin participated ! He performed "Golden Bell". First time in years, check it out! March 30, 2014 - If you or someone you know would like to try qigong or kungfu, check out our deal on Groupon! https://www.groupon.com/deals/manhattan-shaolin-kungfu-qigong. October 2, 2013 - We just posted some new images in our gallery and on the Manhattan facebook page. Check them out! Northport, Long Island September 16 - Classes taught by Shifu Guolin begin at the new location for the Shaolin Temple Overseas Headquarters. Go here for more information. Grand Opening, Sunday September 15, 2013,11am! 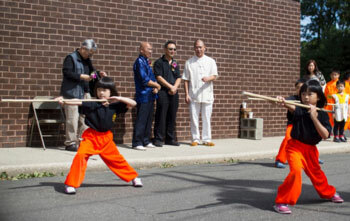 - Grandmaster Guolin invites you to help celebrate the opening of the new Shaolin Temple Overseas Headquarters location at 11 am at 351 Larkfield Rd in East Northport, NY 11731. After the festivities, we will be having a free class... We look forward to seeing you all there!!! Shaolin Temple - Spring Retreat May 25th-26th, 2013: Come join us for the Chuan Yuan Gong Retreat, Memorial Day Weekend! Located at the new Shaolin Temple Overseas Headquarter in Northport, Long Island. Shifu Guolin will teach the traditional Shaolin Kung Fu and the Luohan Duanda form. Rates for the weekend include hotel, workshops, and food - this is an intensive program and lots of information will be covered! Click here for Flyer. Iron Body Seminar at the Shaolin Kungfu Tai Chi Zen Center - Sunday, April 21st at: 2:00 P.M.: 77 Tarrytown Road, White Plains, N.Y. Suite 1W, 10607, By Shifu Cheuk Kwong. Seminar price will be $75. The course will cover Shaolin Iron Shirt & Shaolin Iron Arm. Click here for the Iron Body flyer. The Shaolin Temple Overseas Headquarters and Master Guolin are pleased to introduce Master Gu Kelin to the community. He will be in New York for a very short time to share his knowledge. Please check back soon, in the next couple of days, we will be posting specific seminar and workshop dates. Don't miss this opportunity! Gu Kelin (頋克林) - daoist name Xuanzhen (玄真) – is from Jilin Baishan (吉林白山人). Gu Kelin is a grandmaster of Chinese Traditional Kung Fu, health and vitality cultivator, Ninth Generation Daoist orthodox transmission disciple of the great Daoist Grandmaster Yan Ziqing (颜子青道长) of Mount. Emei (峨眉山). 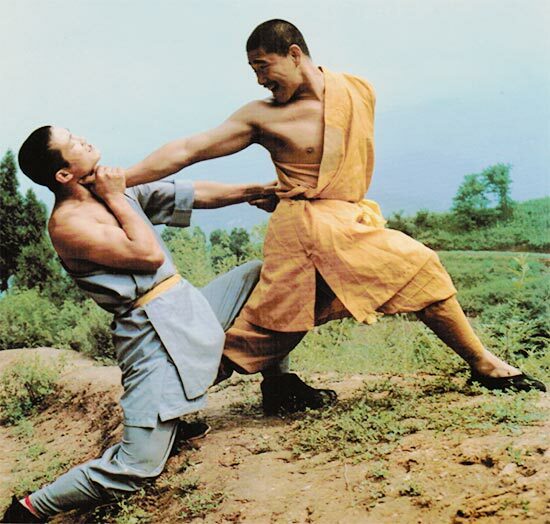 Gu Kelin is also transmission disciple of Shaolin Yanqing (少林燕青門) style kung fu. Currently, he is a first rank Chinese National Wushu judge as welle as the Founder and Principal of Anhui Hongcheng Wushu and Fitness Center. Gu Kelin was born into a Wushu family. Since his youth he studied traditional Shaolin kung fu with his father. Later on he practiced Shaolin Yangqing Fist (少林燕青拳) under the great Master Ji Zhenzhang (季振章大师), a close family friend. Due to hard work and an easy comprehension of wushu principles, the young Gu Kelin quickly mastered the curriculum. Master Ji recognized the young Gu Kelin's rare gifts as a kung fu practitioner and recommended young Gu Kelin to study under an explorer Daoist master, the great Eighth Generation orthodox transmission disciple Daoist Grandmaster Yan Ziqing (颜子青道长) of Mount. Emei (峨眉山). At the age of fourteen, he became a disciple under Daoist Grandmaster Yan Ziqing (颜 子青道长) and was given the daoist name, Xuanzhen (玄真). Thereafter, he followed Daoist Grandmaster Yan and learned traditional Emei kung fu as well as health and vitality methods. Together they traveled throughout China to various cultural enclaves and temples to learn and to exchange ideas. After more than ten years of diligent learning, Xuanzhen (Gu Kelin) received the mantle of knowledge and became the Ninth Generation Emei Daoist orthodox transmission inheritor (峨眉僧们第九代传人), responsible for the sacred task of transmission and expansion of traditional Emei kung fu and its benefits. Since the early 1990s and with the approval of his master, Grandmaster Gu Kelin started on the path of teaching and transmission. In succession at Jilin (吉林) and then at Anhui (安徽), he established wushu and fitness centers to spread the benefits of traditional Emei kung fu and vitality methods. Since that day, the education and transmission effort has cultivated and delivered a number of traditional Chinese kung fu (wushu) talents throughout China. In this way, the sacred contribution of helping communities and society – through individuals' mind and body health improvements - continues.